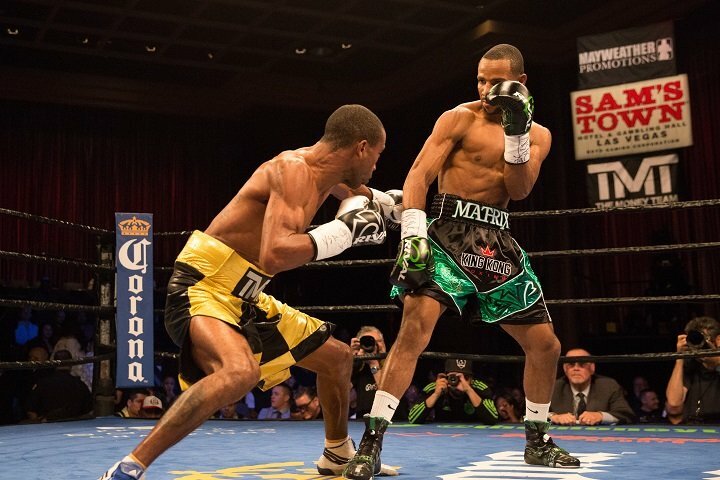 Newly crowned WBA Interim Featherweight Champion Claudio Marrero (22-1, 16 KOs) shocked previously unbeaten Carlos Zambrano (26-1, 12 KOs) with a first round knockout in the main event of Premier Boxing Champions on FS1 and FOX Deportes, Saturday night from Sam’s Town Live in Las Vegas. The fight ended abruptly as Marrero of Santo Domingo, Dominican Republic threw a rock solid straight left hand that sent Lima, Peru’s Zambrano to the canvas, rendering him unable to stand and referee Vic Drakulich waved off the bout at 1:30 of the one and only round. Marrero extended a seven-fight win streak. “After being inactive for a year, of course my timing was a little off I am not happy at all with my performance,” said Zambrano. “This is a fight that was long awaited and I know Marrero has been eyeing me for a while, so it’s just unfortunate the way things ended. The co-main event of the FS1 and FOX Deportes telecast ended in a sixth round TKO by hungry middleweight Nathaniel Gallimore (18-1-1, 15 KOs) of Kingston, Jamaica over Jeison Rosario (12-1, 9 KOs) of Santo Domingo, Dominican Republic.Both fighters came out swinging in the first round with Rosario taking it on all three judge’s scorecards. Rosario, who had never gone past the fourth round started to slow down in the fifth as Gallimore took over. Gallimore came out of the corner in the sixth round determined to end the fight and succeeded. He dropped Rosario, but the Dominican rose to his feet, only to be dropped by a hard upper cut. In the end, it was a left hook that sent Rosario to the canvas for a third and final time as referee Jay Nady waved off the fight at 2:15 of the sixth round. In the main event of the FS2 and FOX Deportes telecast, super lightweight prospect Ladarius Miller (13-1, 4 KOs) put on an impressive performance before stopping Jesus Gutierrez (14-2-1, 4 KOs) in the eighth and final round of their matchup. Miller out boxed Gutierrez with a combination of movement and lead left hands to take control of the first portion of the fight. Gutierrez attempted to close the distance between him and Miller, but was unable to muster up enough offense to slow down his opponent. Several back and forth flurries defined the final two rounds of the fight before Miller was eventually able to use a big right hand to floor Gutierrez and force referee Russell Mora to halt the fight at 2:34 into the eighth round. The opening bout on FS2 and FOX Deportes saw former world champion Layla McCarter (39-13-5, 10 KOs) dominate and eventually stop Szilvia Szabados (15-10, 6 KOs) in the seventh-round of their welterweight bout. Szabados came out aggressive from the start, but the veteran contender McCarter picked her off with power punches throughout the early rounds before Szabados began to wear down and become frustrated. Referee Tony Weeks deducted a point from Szabados for blows to the back of the head early in round seven before a final flurry from McCarter forced the referee to stop the fight 56 seconds into the round. PBC on FS1 and FOX Deportes was promoted by Mayweather Promotions and TGB Promotions and sponsored by Corona Extra, La Cerveza Mas Fina.